Be a Place Where Everyone Belongs. | The girl who loved to write about life. At the risk of sounding just a little bit pathetic, I'm going to tell you a story. I'm a part of a doctor's wives facebook group (which might sound silly, but it's super helpful to get answers and perspective from and just be able to vent to a group of women who have been in your shoes and made it out alive). As soon as we found out where we matched, I added everyone who lived in Gainesville and everyone who was moving there, too. I was so excited-built in friends! I was even more excited to find out that two of the people I thought I would best get along with live right near me! I messaged them both and told them I wanted to get together once we all had a chance to unpack and get settled. They said sure thing, and I was so excited. A few weeks went by, and I messaged them and asked if they wanted to get together for lunch or to go to the pool, and I didn't hear anything back. Which is fine, we're all busy! But then, I started seeing them post pictures together at our neighborhood pool. And it made me feel so left out. I've thought about it way more than I should. Is it because I'm younger? Because I only have one baby and they have multiple kids? Is it because of this? Or that? This is not a blog to say shame on them. In reality, they probably haven't thought another thing about it. They probably just hit it off right away, and are busy. Having kid(s) and making new friends takes a lot of effort. Or maybe they're the kind of people who are comfortable with just a few friends and want to skip the whole awkwardness of making new friends. They probably completely forgot I messaged them. No, this is a blog post to say how often do I do that? How often do I see someone standing alone, obviously uncomfortable, and decide to just stay in the conversation I'm in rather than try to include them? Or when someone says we should get together! How many times do I nod enthusiastically and then don't follow up, because life is busy and getting together takes time? How many times have I seen someone sitting alone in church and it would have taken nothing for me to go sit with them, but I chose to stay where I was? Or when someone emails me asking blog questions, and I think about how long it would take to respond, so I put it off until it's forgotten. Answer: Probably more than I realize. I've probably been the source of people not feeling good about themselves, just because it was easier for me to not get involved. 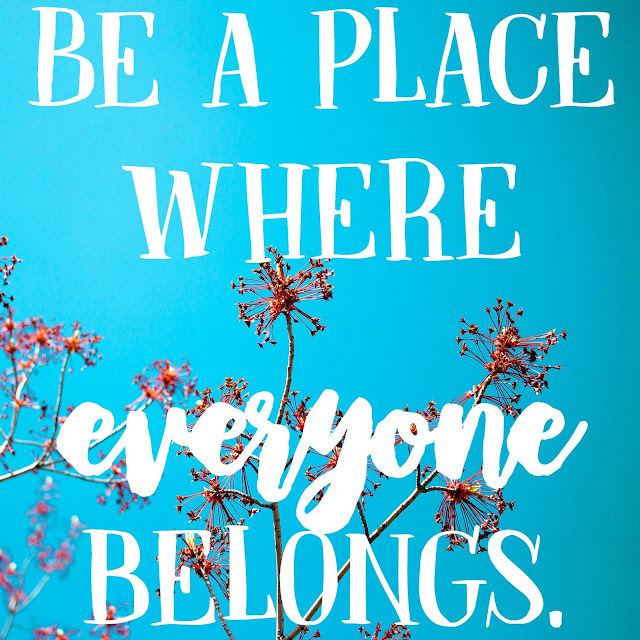 So today, I'm reminding myself to be a place where everyone belongs. In conversations, at parties, at church, in life. It's not that hard. We don't have to be best friends with everyone, ever. It's not our responsibility to make sure no one is ever left out. But one thing we should all strive to be a place where everyone belongs. It's really, really not that hard. Public service reminder: Life is short. Love people while you're here.